The Ruins of Kilwa Kisiwani and Songo Mnara are the remains of two ports that had an important position in East African trade between the 13th and 16th centuries. Kilwa Kisiwani is an Islamic community on an island off the coast of East Africa, in present day Tanzania. In the 9th century it was sold to a trader Ali bin Al-Hasan and over the following centuries it grew to be a major city and trading centre along that coast, and inland as far as Zimbabwe. Trade was mainly in gold and iron from Zimbabwe, ivory and slaves from Tanzania, and textiles, jewellery, porcelain, and spices from Asia. By the 13th century, under the rule of the Mahdali family, Kilwa had become the most powerful city on the East African coast, and its influence stretched as far south as Mozambique. Abu Abdullah Ibn Battuta recorded his visit to the city around 1330, and commented favorably on the humility and religion of its ruler, Sultan al-Hasan ibn Sulaiman. From this period date the construction of the Palace of Husuni Kubwa and a significant extension to the Great Mosque of Kilwa. It is so excited place i have never seen in my life. It took me few minutes to reach the place from Kilwa masoko. My first place to reach were Makutani palace, where there is a large walls then i went straight to Small Domed Mosque before going to great Mosque where sultane Al Hassan Bin Sulaiman used to pray. From there i went to Gereza the Kilwa's fort which historically built by Portuguese. Then i went direct to Malindi Mosque also i visited Malindi graves where the Malindi People from Kenya buried over there. My last visit were to Hussuni Kubwa, the largest building in southern Sahara by the time of 13th to 14th century. I real enjoy the place. My favourite cultural WHS are those which give new and unexpected insights into a civilisation or a period of history. The ruins of Kilwa Kisiwani certainly did that for me by providing an entrée to the world of the Indian Ocean before the arrival of the Europeans (as well as to the impact of their arrival!). Pre-colonial Africa may still be seen as the “dark continent” in euro-centric minds but its east coast played a full part in this ocean’s multi continental trading system. At Kilwa you may get a feeling for the sophistication of what could be characterised as the “Swahili civilisation” between the 11th and 16th centuries and Kilwa was a major centre for the development of that civilization based on influences from Africa, Arabia, Persia and India. Today this island off the Tanzanian coast contains just a sleepy village of around 800 inhabitants engaged in fishing and rudimentary agriculture. But, as you walk the quiet paths, you come across the ruins of palaces, great houses, trading courtyards, forts, mosques and tombs. Despite ups and downs in prosperity, this island was the location of a great trading city for around 700 years, reaching its peak between the 12th and early 14th centuries. Its particular “edge” over other east coast ports lay in its position at the terminus of routes into interior Africa and, in particular, to Great Zimbabwe. From here came gold which was distributed around Eurasia – indeed one period of decline was associated with the 1340’s Black Death in Europe which reduced the metal’s word-wide price. The wealthy of Kilwa could afford luxuries from across the “known world” and, among excavated remains, was 14th century pottery from China. When the Portuguese arrived in 1498 they compared what they saw favourably with their own houses and goods. Some of the ruins are little more than the foundations of buildings with walls of coral rock limited now to a meter high or less but others have largely complete walls and a number, particularly the main mosque, even still have partial roofs. This mosque (photo) contains an original prayer hall from the 11th century and, with extensions, was the largest mosque south of the Sahara before the 16th century. Some buildings, like the fort (“Gereza”), were originally built by the Portuguese who ruled in the 16th and 17th centuries and others like the Makutani Palace date to the 18th century when the rulers were Omani. The real gem is the 14th century Husuni Kubwa Palace (when the rulers came from the Yemen) but this unfortunately is situated a kilometre or so east of the main remains and needs more time to explore than I really had. We arrived by sea on a “cruise” vessel and only had a short afternoon at the site. Given the difficulties in reaching Kilwa Kiiwani by other means (you will probably need to take a dhow from Kilwa Kisoko on the mainland and we saw locals unloading in knee deep water from such craft!!) - I would certainly plan to spend a full day or even an overnight (there is some accommodation on the island and such a stay might enable you to reach the second part of the Inscription at Songa Mnara on an adjacent island to the south). The island is delightfully peaceful to wander around with some fine seascapes and offers good nature walks among a variety of habitats for birds etc to complement the ruins. The people are friendly but little English is spoken although we met many students of the island’s Islamic school scattered in the ruins or under trees learning the Koran! Try also to get hold of the book “Kilwa Kisiwani – Ancient Port City of the East African coast” by Karen Moon (ISBN 9987 440 01 0). This beautifully prepared 68 page book is a real “labour of love” given the relatively few tourists who will reach the site. This was available for us “cruisers” on the quay side but you may have to get it in Kilwa Kisoko where, I understand, you have to visit the local government offices to pay your entrance if you are not part of a group. As it is published by the Tanzanian Ministry of Resources and Tourism (with help from the French government) it is probably also available in Dar although I didn’t see it at the National Museum. If you can’t get it, the site is still remarkably well signed via notice boards containing comprehensive descriptions of each building in English (and Swahili!). In conclusion – Kilwa Kisiwani is an atmospheric place well worth a bit of effort to reach. 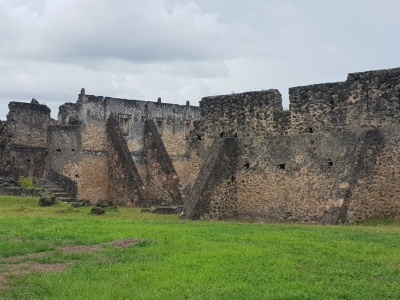 “Old” towns of the East African coast are well represented on the UNESCO list (Lamu, Zanzibar and Ihla do Mocambique) but ruined Kilwa provides a different dimension. In much the same way as Leon Viejo and Portobelo got me closer to the early colonial days of the Americas than other more touristy colonial towns with later “modern” accretions so I felt that Kilwa achieved the same for its area of the world and timeframe. Chinese Porcelain in Africa: "Cowrie shells, pearls of glass, carnelian or quartz were interphased with porcelain of the Sung dynasty as an iteim of exchange from the12th century. Chinese porcelain and Islamic monochrome faience continued to be the vectors of a bartering system well after the appearance of a monetary atelier at Kilwa " (AB eval). Sir Richard Francis Burton: Visited by Burton and Speke who were returning to the coast after Speke had gone off and discovered the source of the Nile! "..rather than return directly to Zanzibar, Burton sent a note to the British consul asking for a coasting vessel and provisions so that a brief exploration could be made of the hitherto unexplored Rufiji river, some 150 kilometres to the south. The boat arrived on 9.2.1859, and the following day Burton and Speke sailed for Kilwa Kisiwani....., but found the Rufiji swollen and flooded by torrential rain. Even worse, Kilwa was in grip of a cholera epidemic which had already wiped out half the population. After inspecting nearby Portuguese and Arab ruins, Burton and Speke beat a hasty retreat to Zanzibar,"
Mosque: Great Mosque of Kilwa - From 10th century but mainly 12th/13th. Sunni (?). First true dome on East African coast.